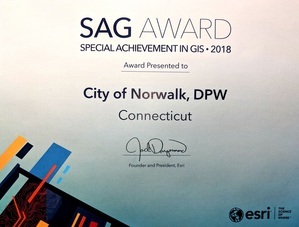 The City of Norwalk Department of Public Works (DPW) received the Special Achievement in GIS (SAG) award from Esri, the global leader in spatial analytics, at the annual Esri User Conference on July 11, 2018. Norwalk DPW was selected from over 300,000 eligible candidates, and received the award for its innovative application of mapping, data analytics, and thought leadership in the field of municipal GIS. Norwalk DPW was honored for leveraging existing GIS technology to provide a more efficient means to manage snow operations. GPS was installed on all plow trucks, and the location data was sent to the city’s GIS in real time, creating an automatic vehicle location (AVL) system. The truck location data was analyzed to determine what streets have been plowed. A web map was created to visualize this data and help staff allocate resources more efficiently. This GPS data was then taken a step further by creating boundaries around schools to determine how much time was used to clear snow from school parking lots, with reports generated to show the total time a plow vehicle spent clearing snow. The annual SAG Awards show appreciation for organizations that are using GIS to solve some of the world’s toughest challenges. Through GIS, the users honored with these awards are demonstrating the most groundbreaking and transformative possibilities of GIS software. For more information on how the Norwalk Department of Public Works is implementing GIS technology across the city, visit www.bit.ly/NorwalkGIS.